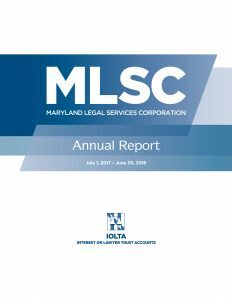 We are pleased to share the fiscal year 2018 annual report of Maryland Legal Services Corporation. In FY18, MLSC grantees helped more than 202,000 low-income Marylanders with a wide range of important civil legal issues. Applications for Maryland Legal Services Corporation funding for fiscal year 2020 are now available. More information about MLSC grants is available in the Grants section of our website, and the application instructions are available on the Grant Application Process page. Note: any organization not currently receiving MLSC funding should contact us at 410-576-9494 before submitting an application. Check your mail! Maryland attorneys will be receiving notification from the Administrative Office of the Courts (AOC) about a new system and deadlines for pro bono and IOLTA reporting. Effective with the upcoming reporting cycle, the AOC will send notifications electronically only (no more paper mailing). The electronic notices will be issued beginning July 10, 2019 and reports must be submitted on or before September 10,2019. It is essential that all attorneys ensure their contact information and e-mail addresses are up-to-date in the Attorney Information System (AIS). Questions regarding registering with the AIS system can be directed to Service Now at (410) 260-1114. For more information, please see https://mdcourts.gov/media/news/2018/pr20181218. Nonprofit organizations interested in continuing or seeking funding from MLSC for civil legal services to low-income Marylanders for FY20 (July 1, 2019 – June 30, 2020) must submit an application no later than Friday, March 15, 2019. Maryland Legal Services Corporation is moving to online grant applications and reporting for FY20. MLSC will host an informational webinar on Tuesday, January 29, 2019 from 10:30 a.m. to 12:30 p.m. Because of the technical information we will be sharing regarding the system, we will not be hosting an in-person meeting this year. Please use the following link to register for the webinar: https://zoom.us/meeting/register/ddf63ea42e36983fc5b9141539e44ee6. After registering, you will receive an email with instructions on how to join the webinar. You will be able to listen to the audio of the meeting through your computer or by calling in on your phone. We also recommending testing your system at https://zoom.us/test before the webinar. The webinar system has a maximum number of attendees. If multiple people from your organization will be watching the webinar, please consider registering one participant and watching together. A recording of the webinar will be available after its completion. In addition to the new grant application process, the webinar will cover general funding policies and priorities, as well as the forecast for MLSC’s FY20 funding level. Additional information about MLSC funding can be found at www.mlsc.org/grants. If you have any questions, please contact us at 410-576-9494 or via email.